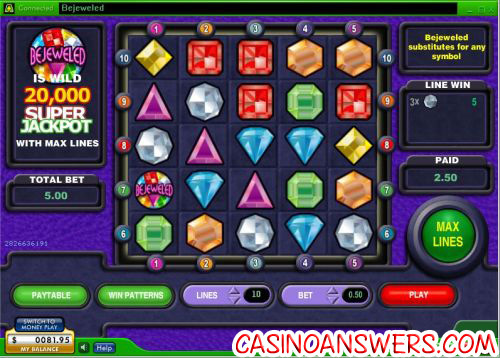 Bejeweled Casual Game Slot Guide & Review - Casino Answers! Bejeweled is a 10-line video slot based on the puzzle game of the same name. It was developed by Cryptologic and can be found at Cryptologic casinos such as VIP Casino and Random Logic casinos such as Lucky Ace Casino. If you have never played Bejeweled or don’t recognize the game, Bejeweled is a very popular puzzle game with seemingly a million different clones. The game is played on a screen, with several different types of gems in rows. You must swap a gem with an adjacent gem to put three (or more) of the same type of gem in a chain. Often, a move can cause a chain reaction (called cascades) that will cause more chains to occur. The Bejeweled video slot has a wild symbol, which is the Bejeweled logo. The Bejeweled wild symbol substitutes for any symbols on the payline. 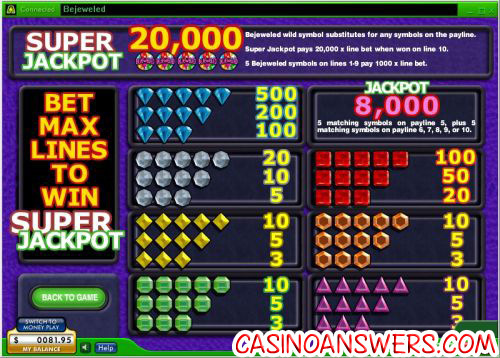 5 Bejeweled symbols on line 10 will trigger the 20,000X Super Jackpot. 5 Bejeweled wild symbols on lines 1-9 will pay 1000X your payline bet. You must play Bejeweled with all paylines active to win the Super Jackpot. Another significant jackpot on the Bejeweled slot is the 8,000X Jackpot. If you have five matching symbols on the 5th payline, plus five matching synbols on the 6th, 7th, 8th, 9th or 10th payline, you will trigger this jackpot. The Bejeweled video slot is unlike any video slot we have seen. It successfully combines the puzzle game with a video slot in a way that makes you forget you are gambling and makes you think you’re playing a game. It may lack bonus rounds and free games, but Bejeweled does have two mega jackpots that will make up for those exclusions to many players. To play the Bejeweled video slot, visit Lucky Ace Casino. Can US players play the Bejeweled video slot for real money? Cryptologic and Random Logic are both not taking US players at this time. For an online casino where you can play some excellent video slots for real money, try Crazy Slots Casino. Does Bejeweled have a progressive jackpot? While Bejeweled does lack a progressive jackpot, it has two large jackpots at 8,000X and 20,000X. If you’re looking for a huge progressive jackpot, try the Marvel Jackpot Slots like Spider-Man, Fantastic Four and Incredible Hulk: Ultimate Revenge. What are the differences between the puzzle game and video slot versions of Bejeweled? The puzzle game of Bejeweled is based on skill, whereas the video slot is based on luck. In the puzzle game, you have a screen of gems that you must switch around to form a chain. In the video slot, you simply hit “Play” and whatever appears is whatever chains you get. Where can I find a free Flash game of Bejeweled? You can find a free Flash game of Bejeweled at any online games website, but if you are looking for a Flash game of the Bejeweled slot machine, you can visit VIP Flash Casino. Unfortunately, you must play for real money as practice mode is not currently available. If you experience problems with the Bejeweled Flash game, try downloading the latest version of Adobe Flash Player.